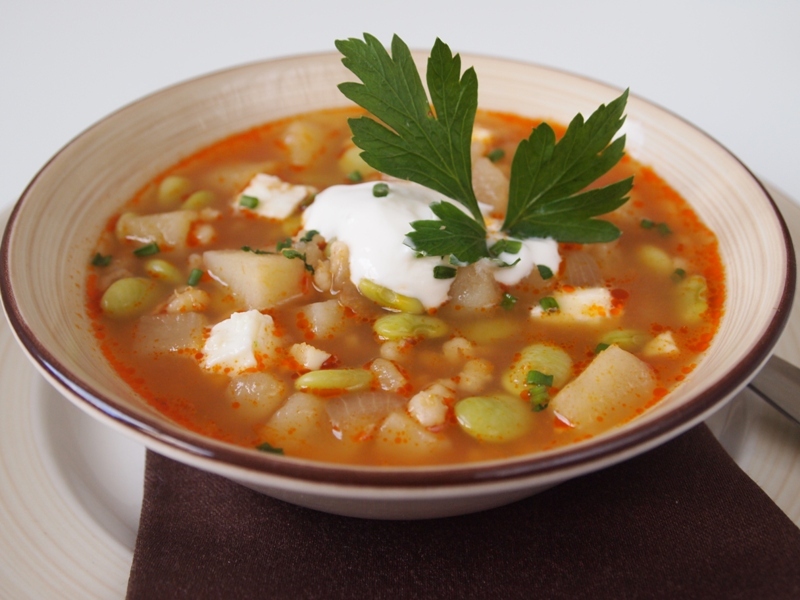 Chupe is a traditional Andean soup with a thick consistency, which usually has lots of robust vegetables and legumes such as potatoes and fava beans. Our most famous chupe is made with shrimp, and crowned with a fried or poached egg, but you can really make it with any ingredients you have at hand. Fava beans and barley are yet another great combination, that will keep you warm in the winter. I’ve replaced the typical milk that goes in the preparation, with Greek yogurt. Traditionally, chupe was a dairy free soup, as the Incan culture considered dairy to be taboo. The milk and cheese cubes added to many chupes nowadays are the result of the Spanish influence on our food.